OTTAWA — Kyle Turris scored 6:28 into overtime to give the Ottawa Senators a 5-4 win against the New York Rangers in Game 5 of the Eastern Conference Second Round at Canadian Tire Centre on Saturday. The Senators lead the best-of-7 series 3-2 with Game 6 at New York on Tuesday. Turris had a shot blocked by Rangers defenseman Dan Girardi, but the puck bounced back to him and he slipped it through Henrik Lundqvist’s pads. Derick Brassard scored for the Senators with 1:26 left in the third period to tie it 4-4. Mark Stone, Mike Hoffman and Tom Pyatt scored, and Craig Anderson made 29 saves for Ottawa, which lost Games 3 and 4 on the road. Jesper Fast, Nick Holden, Ryan McDonagh and Jimmy Vesey scored, and Lundqvist made 32 saves for New York. Michael Grabner scored 4:12 into overtime but the goal was disallowed because it was played by a high stick. Vesey scored his first Stanley Cup Playoff goal with 7:12 left in the third period to give New York a 4-3 lead. He dove after a loose puck in the Ottawa crease and knocked the puck toward the goal line. Anderson gloved the shot, but video review confirmed the puck completely crossed the goal line. Hoffman and Pyatt scored 33 seconds apart in the second period to put the Senators ahead 3-2. Hoffman scored on a cross-ice pass from Clarke MacArthur off the rush at 8:17 to tie it 2-2, and Pyatt scored his first of this postseason at 8:50 when he redirected a shot by Zack Smith between Lundqvist’s pads to give the Senators their second lead of the series. McDonagh tipped a shot by Grabner to tie it 3-3 at 17:49. The Rangers, who have scored first in each game of the series, took a 1-0 lead on Fast’s goal at 4:07 of the first period. Holden made it 2-0 at 5:13 with a shot to the top corner on Anderson’s glove side. Stone won a battle in front of Lundqvist and banked a shot off the left post at 6:03 to make it 2-1. 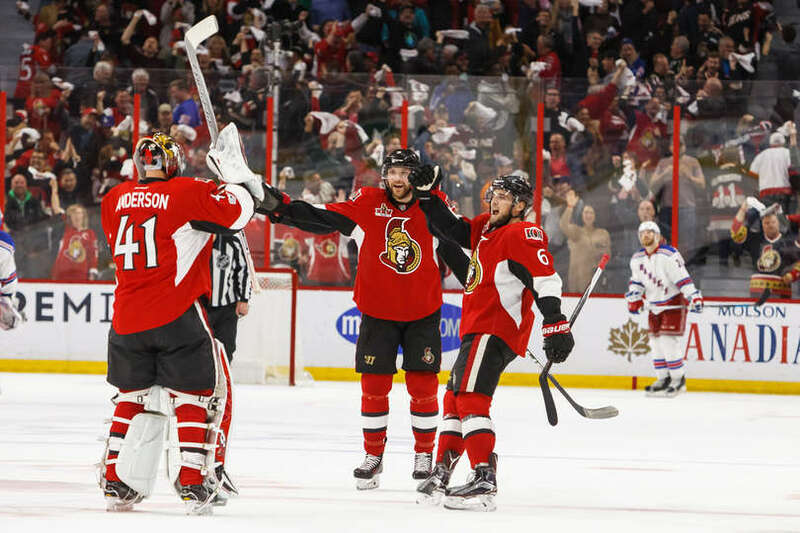 With Anderson on the bench for an extra forward and the Senators trailing 4-3, Brassard batted a puck in the slot that bounced off Staal, forward Tanner Glass and defenseman Brendan Smith before Lundqvist swiped at it as it crossed the line. Rangers forward Chris Kreider broke in from the blue line, but Anderson made the save at 9:02 of the third period to keep the game tied 3-3. Turris scored his third goal of the playoffs and his second in the past two games. The play was started with a long pass from behind the Senators net by defenseman Erik Karlsson. Senators forward Chris Neil played 2:26 in his first game of this postseason. His teammates credited his physical presence, especially against Glass, with giving the Senators an emotional boost at home. “He was massive,” Turris said. “He played a big part in our morale tonight and our intensity. Just him being out there is a big presence, a big impression on all of us. The Senators have led for 13:10 in the series, 8:59 in this game. … The Rangers have scored at least four goals in four consecutive playoff games for the first time since they did so in six straight during the 1994 playoffs, when they won the Stanley Cup. … NHL teams that win Game 5 to take a 3-2 lead win a best-of-7 series almost 80 percent of the time (196-54), according to the Elias Sports Bureau.